Durable construction and helpful features make the Winco BSST-15 Slotted Basting Spoon with Stainless Steel Handle, 15" a winning choice for commercial kitchens. 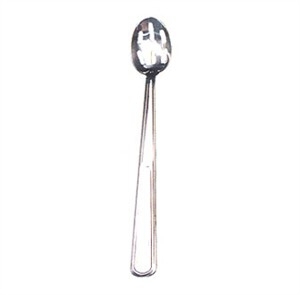 This long-handled, stainless steel cooking spoon has slots that allow oil and other liquids to flow through. The handle of this rust-resistant spoon has a convenient hang hole, so you can store it within easy reach between uses.